In the following guide you will find the needed information on how to implement corner detection with your C# camera application using the Ozeki Camera SDK. In order to make this example work, OZEKI Camera SDK has to be installed and a reference to OzekiSDK.dll has to be added to your Visual Studio project. 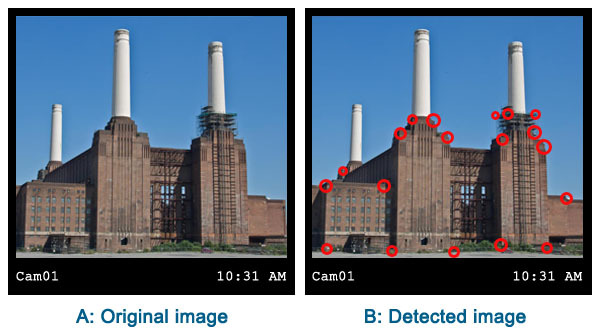 Corner detection can be used to detect corners on an image, which is an important part of image analysis. Corner detection can be extremely useful in the field of construction. To mention another example: corner detection can be also used in land market. If you wish to analyse the images which show different buildings you can benefit from this function. Corner detection can be used with several applications. It can be a great help in quality motion detection, video tracking, image mosaicing, panorama stitching,image registration, in 3D modelling and object recognition. For detecting corners we can use the ICornerDetector object of the Ozeki Camera SDK. After an instance has been created with the help of the static ImageProcesserFactory class we can detect on frames and on video as well. No actions are executed on the input frames they are simply forwarded by default. However, the object which implement the IImageProcesser interface (for example the ICornerDetector) can be added with the help of the AddProcesser() method. More instance can be added which implement IImageProcesser, they will run one after the other using the image which is before them in the list. The initialization of the global variables is the task of the Init() method. The instance of the FrameCapture mediahandler are set here and the ICornerDetector instance is also created here with the help of the ImageProcesserFactory. This also can be added to the ImageProcesserHandlerinstance. The processing of all images is indicated by the DetectionOccured event of the ICornerDetector instance. Here we can subscribe to this event. The SetVideoViewer() creates and initialize the objects which are responsible for the displaying of the video. It defines the VideoViewerWF instances, configures their properties and assigns the appropiate DrawingImageProvider instances. Furthermore, the SetVideoViewers() adds these instances to the GUI. This method handles the GUI thread. It performs a specific method on the GUI thread in asynchronous mode. This method fills the TextBox-es which can be found on the GUI with the actual settings of the ICornerDetector instance using the InvokeGUIThread() helper method. This method connects the appropiate mediahandler instances with the help of the MediaConnector instance. One of the ImageProvider object recives the original image of the webcamera and the other object receives the processed image. After all image/frame processing a DetectionOccurred event is popped up. In the arguments of this event you can find the list of detected corners where the centers/radius and area of the corners can be queried. With this guide you will be able to implement corner detection successfully with your C# camera application using the Ozeki Camera SDK. On this webpage you can find detailed information , exmaples and codes for achieving your aims on the field of corner detection.